Fruit growers who want to plant fruit trees along the coast of North Carolina have to contend with both the weather and the soil in order to get their fruit to thrive. Although the coastline falls into USDA hardiness zone 8, with average low temperatures never below 10 degrees Fahrenheit, the soil tends to be poor. Coastal soil in North Carolina is loamy, but the yearly rainfall is typically well above 50 inches. Any nutrients that might exist in the well-drained soil leech away with this much rainfall. Gardeners planting fruit trees will need to amend the soil to get their trees to grow well. Test your soil for nutrient content as well as pH the fall before you plant your fruit trees. The North Carolina Department of Agriculture and consumer services will test your soil for a fee. Soil-collecting instructions, forms and fees are available on the NCDA website. 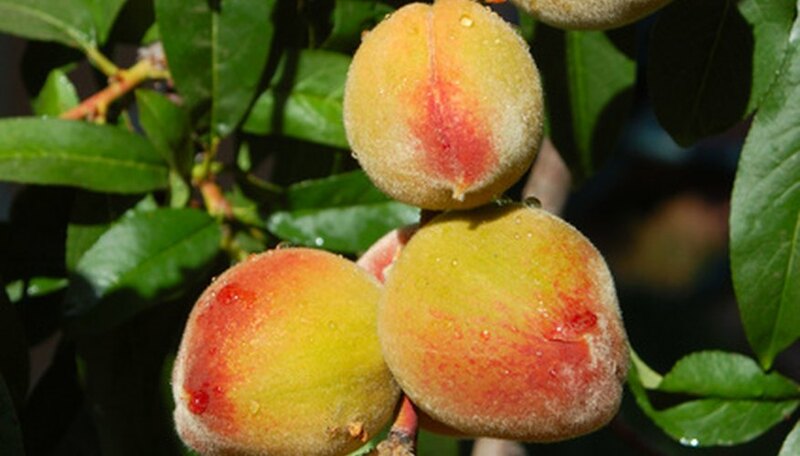 Select fruit trees that are adapted to grow within the coastal region of North Carolina. Cold-hearty trees, such as the apple, will not grow well in this region, but varieties of trees that are not cold-tolerant--such as peach, nectarine, apricot and cherry--grow very well in coastal regions of North Carolina. Select trees with a low chilling requirement to ensure a bountiful fruit production. Break up the ground with a tiller approximately three months before you intend to plant your tree. Work in organic amendments such as compost and manure to improve the nutrient content of your soil. Add dolomitic limestone to raise the pH of your soil. Most soil along the North Carolina coastal region is below 6.5, but most fruit trees grow well in a pH of 6.5. Open fruit tree root bundles immediately and soak for 12 hours before planting. Dig a planting hole that is twice as large as the rootball, but no deeper than the rootball. Prune away diseased or damaged roots. Place the root ball into the soil and cover it with dirt. Keep the soil around the tree as wet as a saturated sponge until roots have established. Wait until the roots become established, then spread 1 cup of balanced (10-10-10) granulated fertilizer over the root system in a 3-foot-square area. Repeat fertilization yearly in March. Schedule routine spraying sessions for pests and diseases to help your fruit trees thrive and produce healthy fruit.